Wouldn’t Bingo fuel be specific to a mission? Tankers available, divert field(s) available or not (blue water ops), etc. Perhaps it wouldn’t change much day-to-day during the same line period but I think it might change more often than some other settings shown. It would be nice if there could be a hierarchical system of settings (like how interfaces are inherited in the object oriented programming paradigm). Have a generic setting in the options but enable users to override them. For each item in the mission card, there is the generic setting but the user can define which items to override with custom settings needed for the mission. Bingo fuel is mission specific. I do believe it is the minimium amount of fuel required to get home or to the divert base. bein able to do the countermeasure programs before flight, and do 'em once is heavensent. Hallelujah! I could be wrong as I only dealt with targeting and mission planning (initially with a system called TAMPS - something like Tactical Air Mission Planning System) - our parts where plotting threats (SAMs/AAA) and mensurating target coordinations, then making sure they were in the system for the aircrew to use. At the end of planning, TAMPS would load onto a box (“brick”) that they would load into the Hornet before they went flying. It seems to me that other stuff like standard weapons and chaff/flare programs could/would be loaded into the jet in a similar fashion. I don’t know who would determine those programs. Squadron, Airwing, Strike U? Forgive my ignorance, but is there a list of available weapons that have been released for the 18 yet? I thought I read that it was a 2 part deal like the 16 will be. I’ll be talking about this much more in the next week or two, but basic JDAM is coming along well. Here is an image of the JDAM in Target Of Opportunity (TOO) mode. This will be in addition to the Pre-Planned (PP) mode. Once the the basic modes are in, we will add the dynamic launch zone indications on the HUD and HSI. In the meantime, we are shooting for (not a promise) D/L SA page and HARM TOO mode for 27 February. I must say, at the rate you all are delivering updates it’s like Christmas every few weeks! Bravo! With the recent improvements to bomb cues, has there been any mention of when salvos will bracket the aimpoint instead of putting the first bomb on the aimpoint? This week we plan to release the initial version of the MIDS/Link-16 datalink / Situational Awareness (SA) page for the Hornet. This is a basic, introduction video to get you started understanding the system. Later, once the datalink is feature complete, I’ll create a full academic video, interactive training mission, and an updated manual. 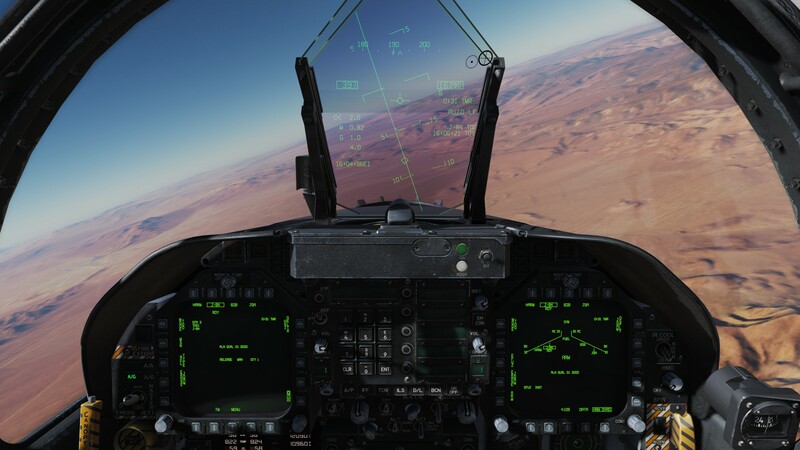 1- This is the initial version with more features to follow like automatic IFF modes, IFF code XP and AI setup, Link-4/HARM/FLIR display options, declutter options, flight ground target markers, basic ROE indications, MIDS voice, and a few more. 2- The logic that determines when a target is own-ship classified unknown, hostile or friendly is determined by an ROE matrix of factors. In this initial release it will be determined by Mode 4, but later we will probably factor in NCTR and SURV. 3- An NCTR print requires an L&S or STT lock, therefore I was unsuccessful in the print attempt. My error. 4- Friendly PPLI data is always fuel state, not range. 5- Later with the TXSDSG, it will be based on flight TGT ground designations, not necessarily WPDSG (it can, but not always). 6- I did not show it, but the static SAM threat rings will be included in the version this week. 7- Sorry for the low energy, I’m recovering from a cold and I’m dead inside. Very cool indeed. This will result in extreme baby seal clubbing on Blue Flag. I’ve been flying blue lately so that’s ok. But once I go back to the Mirage, no doubt the old rage-quit skills will come in handy. would you say mi-rage quits? badabum pssh! I don’t wanna complain, but if the flanker family of aircraft were to have their datalink fixed in multiplayer, now would be a nice timing. 1- Later, we will add the TOO TD box to the HUD. 2- In addition to the line above the emitter that indicates the radar is locking you, an F indicates it is a friendly emitter and a “U” shape indicates a naval emitter. 3- When enabled, LIMIT only shows the 5 highest priority emitters. Otherwise, up to 15 emitters can be displayed. 4- Like SP mode, there is no range indication. 5- Once TOO mode is done, we will implement Pre-Briefed and Pull-Back modes. 6- Once HARM is done, then we will focus on the targeting pod. 7- Yes, I’m still sick and hopped up on cold medicine. This brings up something I’ve been wondering about: will the filter knob for the RWR work in the future? Also, will the volume control knob be implemented as well? Really? The tooltip tells me “not functional” and turning it doesn’t seem to do anything with the RWR volume.